VA Central Iowa Health Care System – Plumb Tech Mechanical, Inc. The VA Central Iowa Health Care System provides health care services to veteran in 42 counties of central Iowa and northern Missouri, by providing acute and specialized medical and surgical services, resident outpatient treatment programs in substance abuse and post-traumatic stress and a full range of mental health and long-term care services, as well as sub-acute and restorative rehabilitation services. 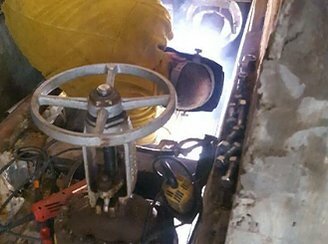 Plumb Tech Mechanical Inc. provided onsite steam line repair services, which included leak sealing, pipeline framework recovery, hot tapping and line stops solid repairs.